iPhone has been tremendously successful, perhaps a little too successful from network provider perspective. 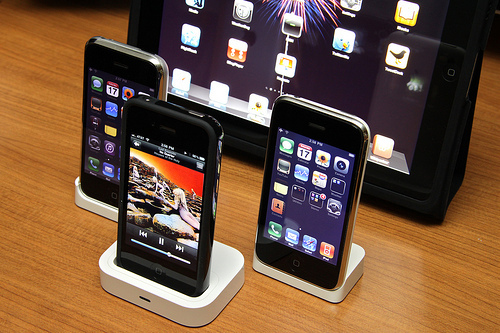 iPhone is a successful device by virtually any measure. It provides a way to access content and connect with the outside world via the Internet with simplicity and ease — and people who own them love to use them. And that’s a problem for providers. They are clogging their networks. At least that’s what I’m reading from complaints from the CEO of AT&T and Sprint’s recent financial troubles. Let’s start with AT&T CEO Randall Stephenson, who admitted publicly at the Milken Institutes’s Global Conference this week that he deeply regretted offering iPhone users the all-you-can eat data plan for just $30. Turns out when you give people unlimited data, they actually use their phones and damn, that bandwidth adds up. You see when you get a piece of highly sophisticated technology that does all kinds of things from show movies to deliver directions to Siri voice recognition, it turns out you want to, you know, use it. Imagine that. But apparently poor Mr. Stephenson felt that all those people who bought iPhones and lined the coffers of AT&T through the initial years of exclusivity were bandwidth hogs and he wasn’t prepared for that. AT&T now offers a tiered plan starting at $20 for 300 MB, $30 for 3 GB or $50 for 5 GB. I still have one of the old unlimited plans, which remains grandfathered in and it’s the only reason I’m still with AT&T at this point to be honest, but if you sign up today, you’re probably looking at a minimum of $30 a month for 3 whole GB. And don’t forget that doesn’t include unlimited texting which will run you another $20 per month. Make sure you download an App that shows you where to find free WiFi around you. Geez. Lest you cry for poor Mr. Stephenson, The New York Times reported that the tiered data plan approach has been very, very good to his company bringing in $6.1 billion in revenue last year. At least AT&T is crying all the way to the bank. Sprint, apparently is not so fortunate. The iPhone has always been a bit of a conundrum for Sprint. They wanted it so badly and once they got it, in order to differentiate themselves from the bandwidth-controlling AT&T and Verizon, decided to offer the old unlimited data plan. Fantastic for you, but for Sprint, not so much. According to a Reuter’s article, Sprint placed a $15 billion bet on the iPhone and so far the phone subsidies combined with the unlimited data access is killing the company, so much so that Sprint CEO Dan Hesse has decided to take a symbolic pay cut in his salary and bonus. Nice, but probably won’t dent that bill. When you see the success of the iPhone, it’s easy to think that it must be a boon for providers too, and in many cases it should be, but it also has a dark side. Users use these phones. They bombard the networks. They tax the bottom line because of subsidies. I don’t cry for the providers though. Instead of whining, be a network and do your job. Of course phone users are going to use bandwidth. If you don’t like it, you’re in the wrong business.